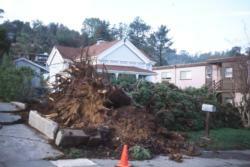 The California Tree Failure Report Program (CTFRP), now called the Western Tree Failure Database (WTFD), was established in 1987 to collect quantitative information on the mechanical failure of urban trees (trunk breaks, branch breaks, and uprootings). This information is used to develop "failure profiles" for genera and species to more accurately assess failure probability in standing trees and thereby reduce failure potential in urban forests. Over 200 tree care professionals in California (and soon members of the other Western Chapter states, Nevada, Arizona and Hawaii) are cooperating in this effort by systematically inspecting fallen trees and reporting failure details for entry into the WTFD database. To date (March 21, 2019) 6148 failure reports have been filed. 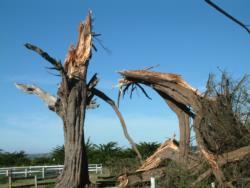 California Tree Failure Report data was (up to 2012) merged with the International Tree Failure Database. August, 2015, The ITFD website is off line for the foreseeable future. January 2018, There is an on going attempt to restore the ITFD...stay tuned. Still happening in 2019. Contact Katherine Jones at treefail@mac.com if you have questions. An occasional e-newsletter, Quick Break, is circulated to CTFRP cooperators. Annual Regional Meetings addressing issues relevant to hazard assessments and failure analysis are presented in January for northern California and March in southern California.